Will change of scenery send J.T. Realmuto into superstardom? Five-tool players are exceedingly rare in baseball today, especially ones who play a premium position. In J.T. Realmuto, the Philadelphia Phillies are acquiring a five-tool catcher who may be on the verge of superstardom, now that Citizens Bank Park is home. Realmuto has been suppressed by Marlins Park, which has rated among the five least-friendly ballparks for hitters in each of the past three seasons. The gap between his OPS there and all other ballparks (.205 points) is equivalent to the difference between Mookie Betts‘ and John Jay’s OPS during that time. Excluding all plate appearances taken at Marlins Park in the past three seasons, Realmuto’s batting average on balls in play (.363) ranks seventh among 366 qualified hitters. Specifically, Marlins Park is where Realmuto’s fly balls have gone to die. In the past three seasons, his slugging percentage on fly balls is 41 percent below the league average there and 17 percent above the league average in all other stadiums. Only 6.5 percent of his fly balls at Marlins Park over the past three seasons found the seats, a figure comparable to the home run rates of Nori Aoki (6.5) and Travis Jankowski (6.3) during that time. But his figure in all other ballparks (15.4) is in line with the rates of Anthony Rizzo (15.7), Adrian Beltre (15.3) and Matt Carpenter (15.3). 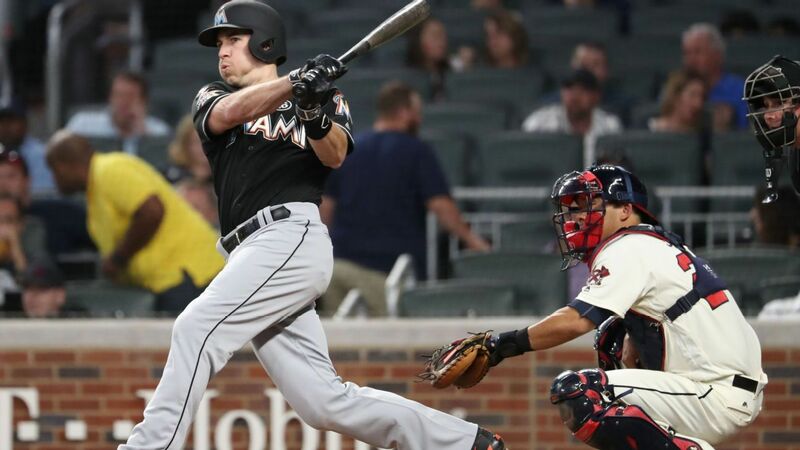 An exodus from Marlins Park may turn Realmuto into an elite hitter, but the quality of his defense behind the plate is already among the game’s best. He has ranked among the top two in average pop time to second base in each of his past three seasons, according to Statcast. Realmuto’s strong throwing arm is easily identified, but his blocking skills are often overlooked. Over the past three seasons, Realmuto ranks sixth in Baseball Prospectus’ blocking runs metric (4.4). The five catchers ahead of him have combined to bat .241 during that time, while Realmuto’s .286 average ranks him third among 48 qualified catchers (behind Buster Posey and Wilson Ramos). Realmuto’s reputation as a poor pitch framer proved accurate in his first two full seasons with the Marlins, but that stigma is no longer true. Over the past two seasons, he ranks 22nd among 99 graded catchers in framing runs above average (+5.2). Over the past three seasons, Yadier Molina is the only catcher with more innings behind the plate than Realmuto (3,159.2). Despite that, Realmuto has not dogged it on the basepaths. He has ranked first among all catchers in average sprint speed in each of the past three seasons, according to Statcast. Realmuto has parlayed his speed into run-scoring opportunities in a way that most catchers never do. He has ranked above the league average in extra bases taken percentage in each of his four full big league seasons. In 2018 he ranked second (at 67 percent) among 278 players with at least 300 plate appearances (behind Eddie Rosario). Realmuto has produced 12.9 wins above replacement over the past four seasons, a mark topped only by Posey (17.9) among catchers. FanGraphs estimates Realmuto has been worth $114 million over that span (33rd among position players). With two more years of team-friendly control (he will earn $5.9 million in 2019) before being eligible for free agency (after the 2020 season), he promises to provide extraordinary value and a variance of skills rarely seen at the catcher position.